The use of a bio-digester for food waste in the Hecht/Stanford dining hall, the construction of a LEED Platinum certified building in the Frost School of Music and the installation of solar panels on top of the food court are just three of many sustainability advancements that University of Miami has undertaken in recent years. 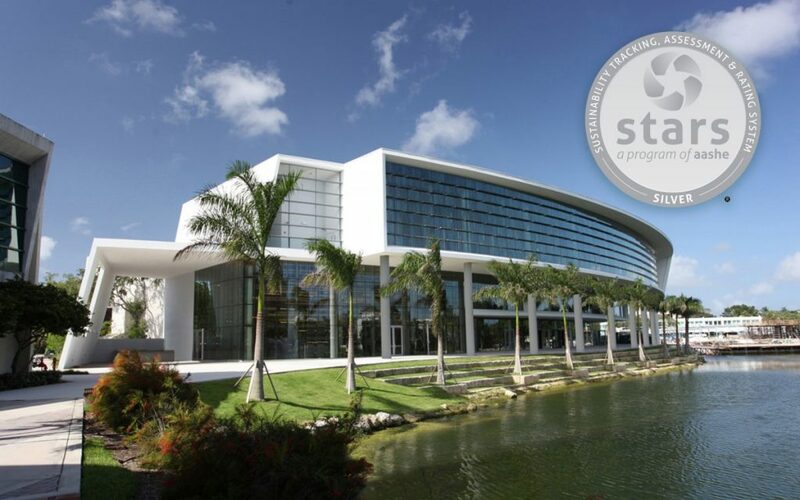 UM was recognized for its progress on this front when it received the STARS Silver rating. The Sustainability Tracking, Assessment & Rating System (STARS) is a way to benchmark college and university sustainability, created by the Association for the Advancement of Sustainability in Higher Education (AASHE). The ratings range includes bronze, silver, gold and platinum, or schools can choose to report their sustainability data without choosing to benchmark with a rating. The application process is rigorous; only two universities, Colorado State University and Stanford University, have a current platinum rating. GreenU, the sustainability office at UM, aims to reapply to STARS every three years in order to give time to plan, implement and measure changes in sustainability initiatives. Teddy Lhoutellier, the UM sustainability manager, decided to apply to STARS to identify and better coordinate pockets of sustainability projects across the university. Some areas for improvement that GreenU identified through the STARS gap analysis included sustainable dining, waste minimization and peer-to-peer sustainability education. “Next time around we’re going to pursue the OP7, which is sustainable dining. We tried to do that this time around, but we fell short basically in terms of time,” Lhoutellier said. Waste minimization efforts are already underway, including establishing single-stream recycling throughout the university and utilizing a bio-digester to convert pre-consumer waste from the dining hall into gray water. UM achieved a 36.5 percent waste diversion rate, according to GreenU, meaning that share of all waste at the university would not go through the municipal solid waste system. GreenU and ECO Agency have also partnered to establish a stronger peer-to-peer sustainability education program called “Eco-Reps.” These representatives will be students living in the residence halls tasked with starting conversations and creating programming for other students on living sustainably. Jimenez, a senior majoring in architectural engineering, said the hope for the future is to have at least two Eco-Reps in each building as an opportunity to have more students involved with GreenU and ECO. “President Frenk’s goal is to be at the forefront of sea-level rise and climate change, so a part with that comes those sustainable efforts, so I kind of want UM to become that forefront of sustainable initiatives of the hemispheric universities or the south,” Jimenez said. Applications for this new program are open on GreenU’s website until Sept. 13.